As it began construction of a brand new Operations and Control Center, the company needed quality, functional and flexible stations for its operators. The Eaton Profile® Console System addressed all of the firm’s needs, while providing aesthetic appeal at the same time. EDF Renewable Services required a command console solution for their 24/7/365 Operations and Control Center that would be flexible, ergonomic and scalalbe for future needs. 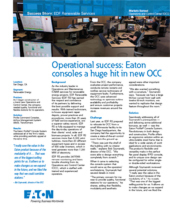 The company chose Eaton’s Profile® Console System for its modular design, ergonomic features and aesthetically pleasing design which was the perfect fit for their state-of-the-art operation.